Home / AC Comics News / Western Treasury Volume 3 -BACK IN STOCK!! [EJUNKIE_ADD2CART item=”1492497″] [EJUNKIE_VIEWCART] A SECOND PRINTING, NOW BACK IN STOCK AND AVAILABLE ONCE AGAIN!! !FIRST “NEW” AC Western reprint in years! 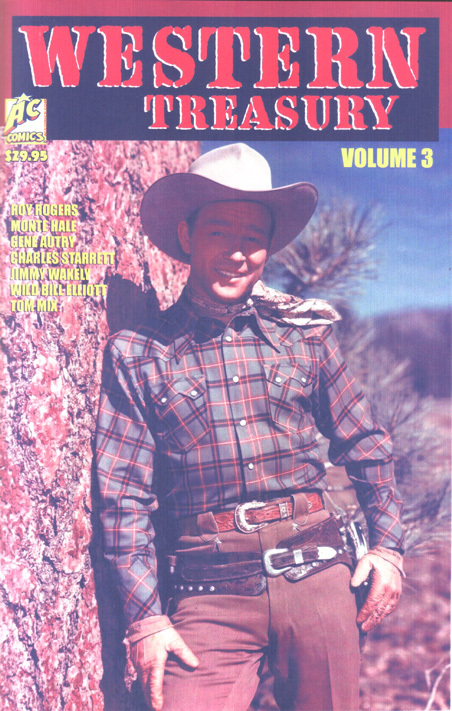 !100 pages of classic cowboy comics of the 1950’s, starring the likes of ROY ROGERS(three full stories), JIMMY WAKELY, DURANGO KID ( a pair of Durango tales), MONTE HALE, GENE AUTRY, WILD BILL ELLIOT, TOM MIX and more!! Ten great stories, featuring the art of Alex Toth, John Buscema, Carl Pfeufer, Joe Certa, John Belfi, Ed Good and other greats. THIS BOOK WAS NEVER OFFERED FOR SALE THROUGH DIAMOND DISTRIBUTION OR COMIC SHOPS IN GENERAL!!! Black and white interiors, full-color covers, saddle-stiched. Released in 2016.